Carver College and Career Academy students recently took up gardening. Students, staff, alumni and volunteers planted the school’s first garden April 21 behind the school at 12400 Branders Bridge Road. About 50 people showed up and got their hands dirty. “Students have been working really hard, learning something new,” first-year teacher and project organizer Rebecca Paoletti said, adding that students were figuring out what plants work best when planted next to each other. “A lot of the kids aren’t used to doing this kind of work,” she said. The plants were grown inside the school under a “grow light” and on a heat mat. About 75 students were involved in the garden project, assistant principal Dana Wilson said. This included agriculture, carpentry and earth science students. 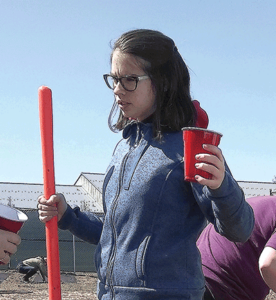 “This is really a program to teach our students where their food comes from and [about] maintaining soil and water usage,” earth science teacher Erin Peebles said. The plan is to use the vegetables in the school’s culinary program with any excess donated to a local farmers market or food bank. The garden will add to projects recently begun inside the school, which has 250 students. These include a grow wall, grow tower and courtyard garden that were started a couple of months ago, Paoletti said. Lettuces, herbs, eggplant, cucumbers, tomatoes, carrots, radishes, spinach and turnips are being grown. Hydroponic and aquaponic methods are also being used to grow food without soil and with the aid of fish. 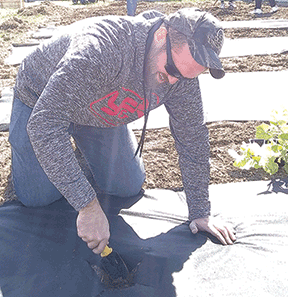 The brainchild of Wilson and school principal Ken Butta, the garden is part of a farmyard that will eventually include a chicken coop and small greenhouse. Rain barrels and a drip irrigation system will come later. Each department in the academy will have a connection to the farmyard, Butta said. The project was funded by a $25,000 grant from Chesterfield County Public Schools. Members of the public who would like to volunteer are asked to call the school at 768-6516.